Aaron's surgery went really well. We showed up at the surgery center at 6:45am. He was pretty grumpy and didn't want to put on the gown. He wanted his Cars pajamas. Even though they gave him Versed, which is suppost to relax you, they had to wheel him off in his undies. The tube placement only took 10 minutes tops and we were home by 8am. It was amazing. He recovered very well and was playing on his playground by 9am. He is already starting to talk better. More people can understand him besides me. He is even napping for me again. YEAH!!! I should have pushed for this a long time ago. Aaron had an appointment with an ENT doctor yesterday due his chronic ear infection since Thanksgiving. He decided since it hasn't cleared up with 3 sets of antibiotics that it probably won't clear up on its own. So, tubes it is. He goes in on Monday Feb. 25. I hope this helps his ears!! Poor punkin! As I said before, Wyatt is our miracle boy. He was born at 1:03pm October 24, 2007. Here's the story. I went into the hospital that day at about 12:20pm, because I wasn't feeling him move. I just though that I was being that nerotic pregnant mom. I didn't even tell my husband that I was going in. When I got hooked up to the monitors he had a heart rate in the 120's. Within 5-7 minutes of being watched his heart stopped. They rushed me to the OR and took him by C-section. I was still in the shirt I came in with and had no IV. They popped an IV in and just dropped me with anesthesia. It took the doctors 2minutes to get him out from the time I hit the OR room doors. It was amazing. 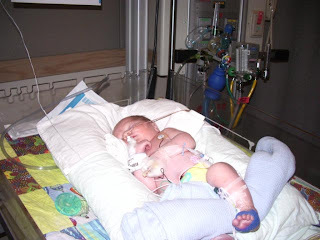 Since he had no heart rate at birth he was considered stillborn. They were able to recessitate him. 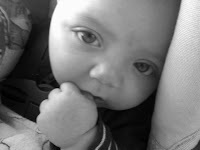 We found out later that he had bled back into me through the umbillical cord over 50% of his blood supply. The NICU doctor had just been to a conference about inducing hypothemia on trauma babies. He actually chilled Wyatt and shipped him to Children's in Seattle. He saved his life. Now, Wyatt is a normal 3 month old baby boy. He smiles and coos. It's the cutest sound in the world. Aaron keeps us going. He has so much energy and always keeps us smiling. He's 3 years old and going on 16. He was born October 13, 2004. Our boys are exactly 3 years and 11 days apart. Aaron always amazes me everyday with all the new things he does or says. He has been battling an ear infection since Thanksgiving. He goes Feburary 13 to a ENT MD and hopefully will get tubes in his ears. My sister and family came up from Southern Utah after Christmas to see the new addition to our family. Aaron just adores his older cousin Gavin and still asks to this day if Gavin can come over and play. I wish we lived closer!!! Aaron loves the movie 'Cars.' So for Christmas between Mom, Dad, and both Grandma's he got every 'Cars' toy imaginable. I thought that getting a backpack to keep them all in would help to keep them off the floor. I was wrong. He just dumps the whole backpack on the floor spilling them everywhere. I guess it was the thought that counts, right? 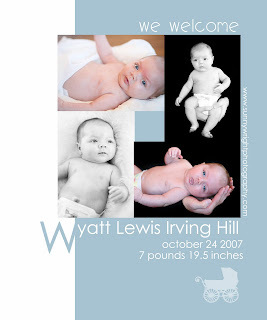 I never got around to sending Wyatt's birth announcement out. Bad mom. So I thought I would post it to redeem some mom points.